The Traffic Clone (Celeber effigia) is an annoying little monster. The Traffic Clone enjoys hanging out in the middle of streets, masquerading as a road block with a bunch of it's other Traffic Clone friends to inconvenience travelers. Almost every time somebody comes across one, they can't tell the difference between it and the real thing, which is especially troublesome for Heroes (Who are already incredibly dull to begin with). 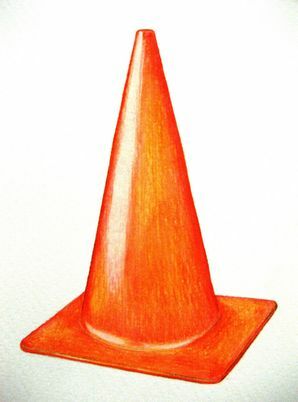 Traffic Clones are usually content to just sit there and block your path, but if someone tries to walk past a group of them (normally a violation of law for real Traffic Cones), they will attack you. Why? Some theorize they don't like having their space invaded. Sometimes one Traffic Clone will get separated from it's buddies, which will cause it to become depressed. It will wander around, looking for it's friends. If a Hero/ine comes across one of these, they should stop, stay still, and wait for it to bounce past them. This is the easiest way to avoid a fight with one. Unfortunately, Hero/ines are stupid, so they will most likely attack it instead. Can blend in with a group of real traffic cones. Most can bounce to heights of around 15 feet. Hidden mouth on their undersides that can be used to surprise your Hero/ine. Easy to predict movements, since most of them require it bouncing. Feelings can be hurt when reminded of not being a real traffic cone. Has no known forms of ranged attack.